The State Flag of Vermont on a field of blue depicts a crest bearing an image of a pine tree and pictures reflecting the main industries of the state. the crest is mounted by a buck's head. 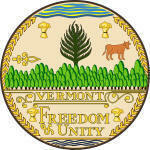 The Vermont State flag serves as a symbol of honor, heritage and regional pride and is displayed at state buildings. There is an Order of Precedence for flags. State Flags are displayed in order as they entered the Union. Car Flags are often displayed to represent of an individual's allegiance to their state. Vermont State car flags are used by their owners as mobile emblems of their home. Car flags are usually made from strong materials and are attached to a car via a pole and clip window attachment. What is the design of the Vermont state flag? What does the deer symbolize? What do the pine boughs and pine tree symbolize? What do the other images symbolize? There are pictures of a pine tree, a cow and three sheaves of wheat representing the agriculture industry with mountains rising in the background. The ratio is 3:5 meaning it is 3 units tall for every 5 units wide. Who designed the Vermont State Flag? 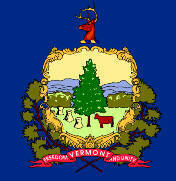 What is the history of the Vermont State Flag? 1804: The next Vermont flag was a militia flag depicting 17 stars and 17 alternating red and white stripes with "Vermont" in upper case above the stars and stripes. It was expected that the U.S. flag would change to 17 stars and 17 stripes but this did not happen resulting in the Vermont flag having more stripes than the national flag. 1837: Vermont changed its design to include 13 stripes and one large star on a blue background that contained the coat of arms. 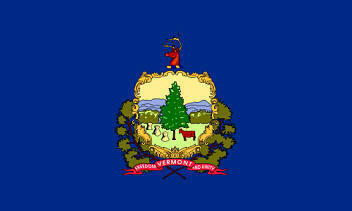 The Vermont flag is kept and used as required by the code specified in the constitution of the state.